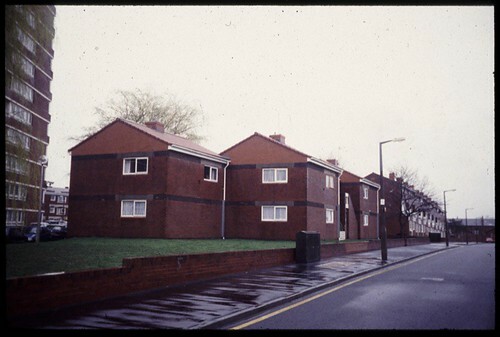 …and took the form of thin blocks of flats and maisonettes around a communal garden. The associated cubic forms were housing for old people. Pictures taken soon after construction show Stirling’s idea of using utility structures on the facade to articulate individual dwellings. His own pictures show the occupants using the communal ramps at the end of the block and include 19th century dwellings in the background. …and the old peoples’ houses have lost their pyramidal roofs. 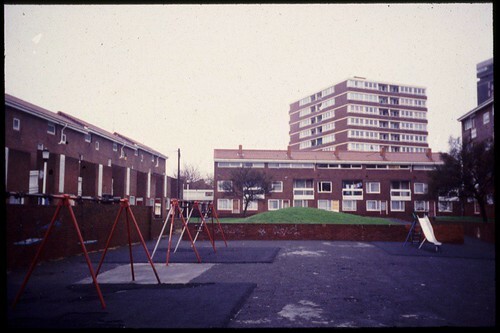 The whole scheme was recently demolished along with the adjacent tower blocks.